Here’s a noodle-scratcher to start your day off: Stuff Middle East is reporting that RIM and Porsche Design are teaming up for an event next Thursday that promises to show off an “exclusive collaboration” between the two companies. Could the rumored Porsche Design BlackBerry finally see the light of day? For those who didn’t catch it the first time round, photos of a funky-looking BlackBerry allegedly called the “Knight 9980” first surfaced back in September courtesy of a Chinese forum called MaxPDA. It didn’t look like any other BlackBerry we’ve seen before: the Knight has a more angular chassis than your typical BlackBerry and (disconcertingly) what looks to be a much flatter keyboard. The reason for the radical change in design was because the Porsche Design team was supposedly in charge. They may seem like a strange choice, but Porsche Design has transcended the automotive trappings of its parent company to design everything from feature phones to hard drives to bobsleds, so a special edition smartphone doesn’t come entirely out of the blue. Personally, I think this is one to file under “I’ll believe it when I see it.” Unveiling a niche, fashion-forward device seems like a very strange step for a company that has just recently recovered from a multi-continent outage and is working to regain the trust of their customers. If people don’t feel like they can rely on their BlackBerrys, then what would drive someone to buy another one, let alone one that seems to put form ahead of function? Sure, fans of limited-edition gadgetry will probably snap them up anyway, but something about this situation just feels odd. I’ve reached out to RIM for some clarity on the situation, but haven’t received a response at time of writing. Stay tuned for updates. 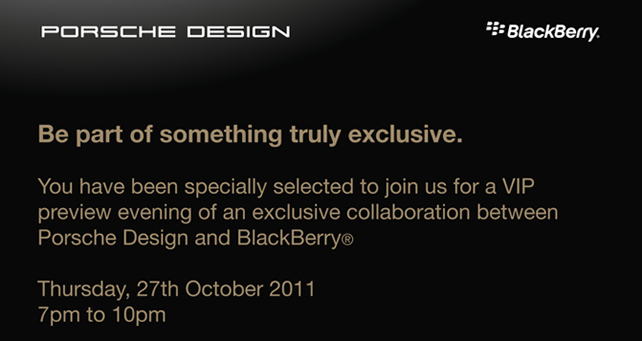 UPDATE: A RIM representative has confirmed that the invite-only event will be taking place in Dubai next Thursday.